Today we have a fantastic review from Martin who has one of our CISS systems. If you'd like to be entered in our monthly prize draw, and receive a discount on all dye and pigment ink purchases, send your review to reviews@cityinkexpress.co.uk. 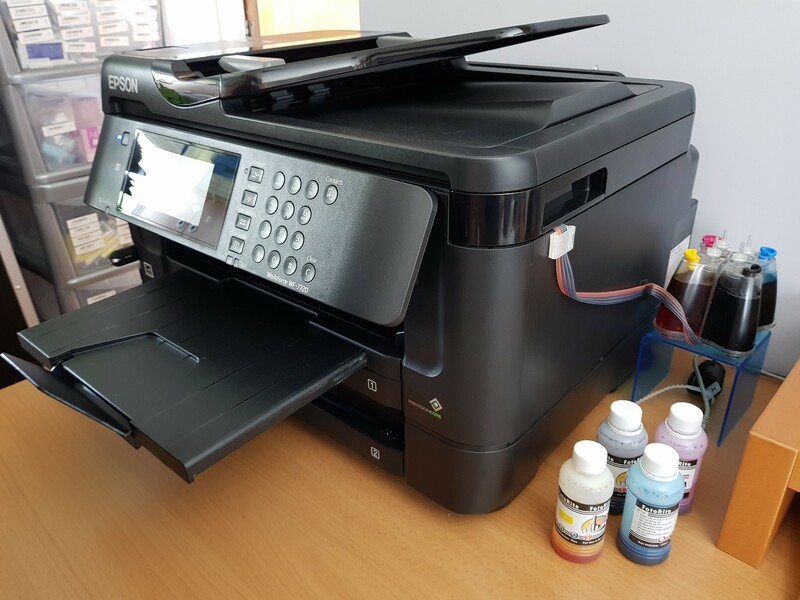 I purchased my CISS system at the end of May 2018 to add to my brand-new Epson Workforce WF-7720. I was already a fan of the system having purchased a CISS unit from City Ink Express for my old Brother MFC-990 CW printer (which is still working flat out with no change of quality) back in December 2016. The package arrived early the next day – amazing service. I opened up the tutorials on You Tube and found them so easy to follow – all done in real time. The installation was an absolute doddle with the WF-7720, in fact it took less time than the You Tube video took to run. The printer has been in constant use in our small but busy office working alongside our old and trusty Brother MFC-990 CW. Since switching to CISS we have noticed a huge difference in the amount of waste ink cartridges and no inky fingers! Well done to all the team at City Ink Express, your attention to detail is second to none. Today we have a fantastic review from Tony who has one of our CISS systems. If you'd like to be entered in our monthly prize draw, and receive a discount on all dye and pigment ink purchases, send your review to reviews@cityinkexpress.co.uk. My first attempt to pick the pockets of those who make a fortune selling us a few mills of ink for a huge mark up. I did my homework, found the appropriate videos to watch (are you taking notes here?). Watched the videos again, watched for different machines to make sure they were not all the same but specific and took the plunge. Delivery spot on ; ordered (At Bank Holiday weekend) on Friday and arrived Tuesday. Packaging: sturdy box well packed. Contents more than adequate to do the job. I had done my research and admire the people here make their video guides available to everyone. I was sure I could do the filling process and ignored the advice to use one of the supplied large syringes... Big Mistake! If you have a shaky hand use the syringe (I’m still washing the ink off my fingers (which shows its good stuff I guess). The guides are brilliant they make a simple process, well, simple! I’m printing off my song lists and the ink is no problem I did no Lab test research but it goes on, dries, no runs, no fading, no problem – as good as any I’ve bought ( I think). This is my first time using this service and am enjoying the freedom to print reams of stuff rather than only print essentials. I’ll see how much I print and let you know in a few months time. Today we have a fantastic review from Graham who has one of our CISS systems. If you'd like to be entered in our monthly prize draw, and receive a discount on all dye and pigment ink purchases, send your review to reviews@cityinkexpress.co.uk. I have been using this excellent system for a little while now and am really pleased with the results. As I print colour photographs for display and calendars each year for my extensive family and friends, quality is most important. Cost isn't necessarily the most important factor, but having set up the system with the six tanks and first lots of ink, then the resultant cost saving is impressive. In the past few days, I have been making comparative prints of some I have done in the past, using a different printer and inks. These were printed on gloss paper at the highest standard setting and I considered them most impressive. Using the new system and inks with a similar type of paper, there is an obvious improvement in sharpness and colour rendering: quite impressive. On my Facebook page, I have commended this system to my family and friends and I commend it to any who check this website for information about City Express Ink System.